In 1984, Mali's interior minister gave SOS Children's Villages the "go ahead" to implement Hermann Gmeiner's idea. The people of Mali face reoccurring droughts and persistent poverty. Education and health facilities leave much to be desired. Thousands of children without parental care, many of them orphaned by AIDS, make the work of our organisation in this arid African country highly necessary. At present there are three SOS Children's Villages in Mali, one SOS Youth Facility, three SOS Kindergartens, three SOS Hermann Gmeiner Schools and six SOS Social Centres. Mali is a country marked by grinding poverty. Unfortunately, child abandonment is very common due to the socioeconomic challenges that many families face. SOS Children's Villages has been active in Mali since 1987 in order to protect and support vulnerable children and their families. The organisation has been running SOS Family Strengthening Programmes in order to support children who are at risk of losing the care of their family. At present, SOS Children's Villages is supporting children and young people in three different locations by providing day care, education and medical assistance. When children can no longer stay with their families, they are cared for by their SOS mothers in one of the SOS families. SOS relies on the kindness and generosity of Canadians to be able to provide a home for the most vulnerable children of Mali. Please help us ensure a loving home for every Malian child. Sponsor a child in Mali now. The total population of Mali is 14.1 million and its capital is Bamako, a city of 1.6 million. At present, Bamako is one of the fastest growing cities in the entire world. The Sahara and the Sahel-desert cover practically the entire Malian territory, making it a very arid country that constantly suffers from drought. Mali's most important agricultural zone is the inland delta of the Niger between Ségou and Timbuktu. In 1992 Alpha Oumar Konaré won the country's first multiparty elections. Despite being one of Africa's poorest nations, the political and social situation in Mali has remained fairly stable. Cotton, one of Mali's major export commodities, has decreased in value on the world market. Mali has argued that subsidiaries given to U.S. cotton farmers depress prices and restrict the Malian farmers' access to export markets. At the same time, goods that the country has to import have become more expensive. Although poverty reduction programmes have considerably reduced poverty levels in Mali, the country remains one of the poorest in Africa. According to the United Nations Development Programme, 51 per cent of its population live on less than one US dollar per day. Poverty is particularly persistent in certain rural areas of the country. The rural inhabitants of the Sahel-Saharan region face unimaginably precarious living conditions. Arid Mali is a landlocked country and thus extremely vulnerable to unexpected climate variation. Many people depend on subsistence farming and are therefore highly affected by droughts and other natural disasters. If crops are destroyed, many people face starvation. The northern regions of Kidal, Gao and Timbuktu represent the poorest zones of Mali. Access to education is nothing but wishful thinking for hundreds of thousands of Malians. Only 26 per cent know how to read and write and very few receive a primary education. 23 years of military dictatorships have left deep scars in the population. Although educational campaigns aiming to eradicate female genital mutilation have been introduced, the phenomenon is still common. Discrimination against women persists in many areas of the country and educational and professional opportunities for women are generally very limited. 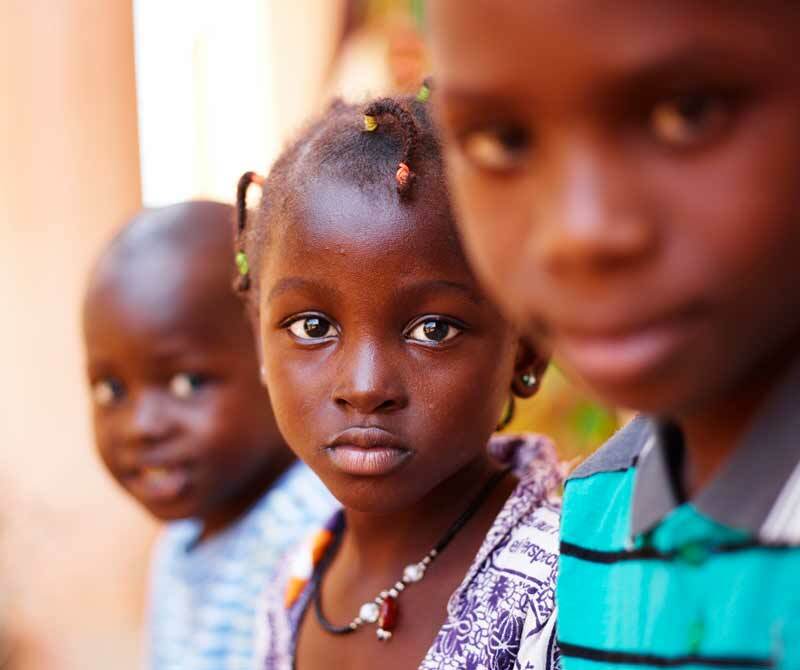 690,000 children in Mali are orphans and grow up without parental care. The average Malian mother gives birth to 6.5 children - one of the highest fertility rates in Africa. However, at 111.3 deaths per 1,000 live births, Mali is also marked by one of the highest infant mortality rates in the entire world. Perhaps the most alarming fact is that infant mortality rates have not substantially improved since the 1990s. Malnourishment among young children is an issue of growing concern in one of Africa's poorest countries. More than one in three Malian children suffers from stunting. Even in the best of times, food security in Mali is precarious. During periods of drought, the situation for Mali's children gets particularly worrying. Child labour is widespread in Mali, predominantly in the informal and agricultural sector. Quite often, children are subject to human trafficking. They are sent to Cote d'Ivoire where they work on cotton and cocoa plantations or as domestic workers in private homes. In Bamako, children work unprotected in recycling centres, welding and reusing metal over charcoal fires. Furthermore, thousands of children are recruited for religious training by fundamentalists. These children are often separated from their parents for longer periods of time and travel from village to village together with a Koran teacher. In Mali, 92 per cent of women have undergone female genital mutilation. As a result of cultural beliefs, most of them are carried out before the girls reach the age of five. Apart from the psychological implications, other negative consequences include a high risk of contracting HIV, infertility, haemorrhage and even death. In comparison with most other African nations, Mali has a fairly moderate HIV-prevalence rate of only one per cent. Access to anti-retroviral therapy has improved noticeably over recent years, resulting in a lower number of new child infections. The Malian government has intensified efforts to fight HIV by investing in awareness campaigns, testing and medical therapy.